1. Abayomi Ayoola: Lead Technical Consultant, Corvio Technology Services is the brain behind a working system that seeks to match clients with whatever vision of success looks like to them via the mastery of merging existing technologies. 2. Abiodun Thorpe: An Experienced Digital Strategy & Analytics Consultant at Rainy Lemon, a Digital Strategy and Analytics Company. 3. Abiola Olaniran: Founder of Gamsole, Africa’s leading gaming company that creates and distributes fun mobile games for smartphones. 4. Adedayo Oluokun: A Software Developer at IROKO Partners Limited, who is passionate about Natural Language Processing especially for African Languages. 5. Adedoyin Ogundoyin: The Creator at West African Gaming Expo (WAGE), a company which aims to introduce educational gaming, game designing, game development and game playing to the local African community. 6. Adeoye Ojo: Co-founder of suregifts.com.ng, a pioneering innovative e-commerce platform that is debuting gift cards in Nigeria. 7. Afua Osei: Co-founder of She Leads Africa, a community that helps young African women achieve their professional dreams. 8. Alhassan Abdulkadir: Creative Director at Digitale Nigeria, a company that deals in Software, Hardware Customizations and Media Services. 9. Anesi Ikhianosime is the teenage second half co-developer and designer for Crocodile Browser lite- a functional, fast browser for feature and low end phones. 10. Aniedi Udo-Obong: Former General Manager at Afro cab- an Afro taxi app that connects passengers with drivers in Africa. 11. Anike Lawal: Founder of mamalette.com, the go-to community for Nigerian mothers that provides tools and resources that help Nigerian mothers and mothers-to-be connect with others going through similar experiences. 12. Bankole Oluwafemi: Founder and chief editor at the Techcabal.com, an online publication focused on promoting conversations around technology. 13. Bilqiss Adebiyi-Abiola: Founder and CEO of WeCyclers, a company that offers waste collection and recycling services to the city of Lagos. 15. Bolarinwa Motoni: Managing Director of Jekalo.com, a carpool service that helps you connect and hitch a ride with those going in your direction. 16. Bosun Tijani: Founder of Truppr — a social tool that connects you to events and people around you to help make regular exercise a lifestyle. 17. Charles Emembolu: Chief Executive Officer of Crestsage Limited – an IT company that provides financial services to users. He is also the co-founder of Tech Quest, an online platform that is teaching children how to use technology. 18. Chibueze Opata: A programmer and web developer who specializes in technology solutions with emphasis on security and artificial intelligence to solve the challenges facing the African continent. 19. Chika Uwazie: Vice President of Business Development & Partnerships for Talentbase Nigeria, an affordable and easy-to-use HRM solution enabling HR managers and growing businesses simplify and organize their HR processes. 20. Chinedu Azodoh leads the engineering team at MAX, a logistics startup for small businesses keen on data in order to optimize delivery time and improve user experience. 21. Chinedu Mordi: Co-Founder of Vibeoo (vibeoo.com) which is being positioned to be Africa’s biggest audio content platform currently in BETA. 22. Chioma Chuka: Founder of TechHerNg.com –an online platform that is bridging the gender gap in the technology industry. 23. Chioma Ifeanyi Eze: Founder of accountinghub.ng, an online portal that offers the needed accounting services to Nigerian small businesses. 24. Chuka Ofili: Co-Founder and Chief Enterprise Architect who developed and implemented a SaaS value-added service for MTN and Etisalat (two of Nigeria’s biggest Mobile Network Operators) performing transformations on tens of millions of phone records. 25. Chukwuemeka .F. Agbata: Co-producer and presenter of Tech Trends, a weekly technology program that shows on Channel Television, a columnist and the brain behind TechSmart.ng, a tech blog focused on sharing helpful tech tips. 26. Dami Solesi: Chief Executive Officer and Creative Director at SMIDS Animation Studios, a Lagos-based design studio into computer animation, motion graphics and visual effects. 27. Damilare Akinlaja: A mobile, web and Video games developer, Damilare currently works as a video game developer for ChopUp games. 28. Damilola Teidi: Managing director and co-founder of GoMyWay.com –a ride-sharing marketplace that connects passengers with ride owners traveling on the same route. 29. Demola Odebola: Co-founder of NerdBevy Limited, an Information Technology company that aims to provide solutions in Nigeria’s IT space. 30. Desiree Craig: Technical Lead, Youth Education Program at Co-creation Hub Nigeria. She participated in the Re:Learn project –an open living lab focused on learning and the smart application of technology in schools. 31. Dipo Fasoro: Managing Partner at MacGrenor –a digital company that delivers design tech products and offer cost-effective products and solutions. 32. Editi Effiong: An internet marketing and App development enthusiast, Editi is the managing director of Anakle Nigeria, a digital agency which builds experiences for online and offline audiences as well as develop strategy and execute campaigns for clients and agencies. 33. Emeka Afigbo: A software developer and a Manager, Strategic Product Partnership at Facebook. He has previously worked with Google, as a Program manager. 34. Emmanuel Olaere: A video content creator, photographer and Youtuber, making videos through his Youtube channel, GeekCeption. 35. Etoniru Chibueze: A Mobile technology enthusiast. He is the editor of Mobilityarena.com –a mobile technology blog. 36. Evans Akanno: Founder and Chief Executive Officer of Cregital –a fast growing company specialized in the creation of web designs, branding and internet marketing for brands. 37. 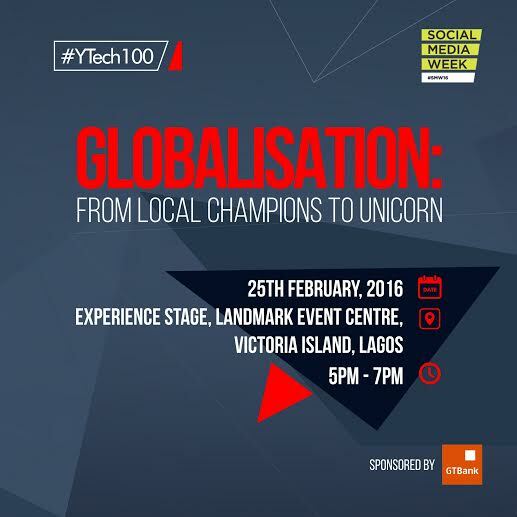 Eyo Bassey: A software developer and entrepreneur, Eyo is the Chief Executive and co-founder of PayPorte. 38. Ezra Olubi: Co-founder and Chief Technology Officer of Paystack – an e-Payment company in Nigeria. 39. Felix Dung: He is the owner of Ask An Expert –a mobile live chat platform that allows users to connect with business experts and professionals across Nigerian. 40. Femi Ariyo: A technology innovator, Femi is the co-founder and Chief Technology Interpreter at Fressia Networks. 41. Femi Longe: A social innovator and the co-founder of Co-creation Hub (CcHub). Femi currently serves as the program director of CcHub. 42. Funkola Odeleye: Co-founder of DIYlaw.ng and also the corporate/commercial lead at the Longe Practice. 43. Gossy Ukanwoke: Founder of Beni American University –a modern liberal art university with a focus on software development, entrepreneurship development and media. 44. Gbenga Sesan: A social innovator, Gbenga is the Executive Director of Paradigm Initiative Nigeria (PIN) –an initiative that is targeting the growth of youth-led social enterprise using ICT. 45. Honey Ogundeyi: Co-founder and Chief Executive of Fashpa.com –a leading online retailer in Nigeria. 46. Iyinoluwa Aboyeji: A serial entrepreneur, Iyinoluwa is the co-founder of a global talent accelerator –Andela. 47. Jason Njoku: He is a serial entrepreneur, startup investor and the Chief Excutive of IrokoTv, a company he co-founded. 48. Kehinde Ayanleye: Co-founder of Stutern –an internet platform that connects prospective interns to companies. 49. Khalil Muhammad: An academic with several publications in the fields of computer science and big data. He is also a software developer. 50. Kola Tunbosun: He is a linguist, who created an online multimedia database for different Yoruba names. 51. Lawal Babafemi: An entrepreneur, business analyst and co-founder of Suregift.com – the premier e-commerce gift card mall in Nigeria. 53. Mark Essien: Chief Executive Officer (CEO) of Nigeria’s biggest hotel booking service, Hotel.ng. He is also a software developer. 54. Mayowa Owolabi: An international business facilitator and the co-founder of Mobile Monday in Nigeria –a global community of mobile technology professionals. 55. Modupe Macauley-Odunyemi: Founder and Chief Executive Officer of Capital Square Workspace Solution Limited, the first co-working space in Lagos. 56. Moyinoluwa Adeyemi: Web developer; a Google trained Android applications developer, who currently works as a software engineer at Swifta Systems. 57. Nicholas Allo: Nicholas is a PhD holder, an academic and social geographer. He is a director at Visual Earth Limited. 58. Nkemdilim Uwaje: A known professional in the Nigerian Information Technology market, Nkemdilim is the owner and managing director of Future Software Resources Ltd.
59. Nnamdi Ekeh Jnr: He is the Vice-President of Yudala, in charge of the online version of the fast evolving electronic business in Nigeria and one of Nigeria’s foremost e-commerce stores. 60. Odunoluwa Longe: Co-founder of DIYLaw.ng and lead counsel at the Longe Practice LP. Odunoluwa calls herself the lawyer of entrepreneurs and she hopes to bridge the gap between technology and law. 61. Ofure Ukpebor: A web and mobile developer. She is the Head of Technology at Anakle Nigeria. 62. Okechukwu Ofili: He is the founder and owner of okadabooks.com –an innovative and easy-to-use mobile book app that won the MTN 2013 app of the year. 63. Okezie Okpara: Chief Executive and founder of ReelIf –a futuristic app that is redefining the way pictures are printed in Nigeria. 64. Olamide Egbayelo: A social media and mobile marketing enthusiast, Olamide is the Digital Media Manager of Paradigm Initiative Nigeria (PIN). 65. Olayemi Moses: A web developer and User Interface designer. She is also the Digital lead at RED Media Africa. 66. Oluwapelumi Oyetimein: A Certified ICT & Digital Media Professional. He currently works at RED Media Africa. 67. Abisoye Ajayi: A Microsoft and Oracle certified expert, she is the co-founder of Pearls Africa Foundation, a company focuses on training young girls from the slum to code. 68. Oluyomi Ojo: Co-founder of Printivo.com –an online platform that allows users to create and print their own materials. 69. OO Nwoye: Co-founder of Fonenode –a leading company specialized in the building of telephony products for developers and small businesses. 70. Opeyemi Awoyemi: A web development enthusiast, Opeyemi is the co-founder of Jobberman.com – Nigeria’s No. 1 job recruitment website. 71. Opayemi Obembe: Co-founder and Chief Technology officer of Callbase –a web application that allow users to set up a call center in a short time. He is also the lead developer at Writerack. 72. Ore Somolu: Executive director of the Women’s Technology Empowerment Centre (W.TEC), an organization working at empowering girls using technology. 73. Osine Ikhianosime: He is the 13 year old co-developer and coder of the web browser –Crocodile Browser Lite. 74. Peter Ihesie: A software Architect and chief executive officer of Churchplus –an innovative software for church management. 75. Rodney Jackson-Cole: The founder of Osusu Mobile –a financial service that enables users to save money more conveniently. 76. Samuel Biyi’Laolu: An internet enthusiast, Samuel is the co-founder of Suregift.com –Nigeria’s premier gift card mall. 77. Sanusi Ismaila: He is the founder and editor in chief of Techsuplex –an online based technology magazine. 78. Seun Akinfolarin: Seun is the founder of Hospital+, a hospital records management system. 79. Seun Onigbinde: Co-founder and Chief Exercutive Officer of BudgIT.com –a company dedicated to help citizens understand the intricate details of government budgets. 80. Seun Osewa: Founder and Chief Executive of Nairaland.com – Nigeria’s largest internet forum. 81. Sherrif Shittu: An entrepreneur, who is the founder of Showroom.ng –an online showroom for furniture and home décor. 82. Silas Okwoche: Co-founder and CTO of Nerve Mobile, a media platform that is bringing digital content to Africans. 83. Sim Shagaya: He is the founder and Chief Executive Officer of Konga.com, Nigeria’s leading online marketplace. 84. Simeon Ononobi: An information and technology service provider, Simeon is the founder and Chief Operating Officer of MyAds. 85. Stanley Ojadovwa: A web and mobile developer. He is the co-founder and team lead of Codulab –an education platform focused on exchange of ideas. 86. Taiwo Ayanleye: Co-founder of Stutern, an internet platform that connects prospective interns to companies. 87. Tayo Oviosu: Founder of Paga tech Ltd. He also serves as its Chief Executive Officer. 88. Temitayo Olufuwa: A mobile and web developer, Temitayo is the digital security lead at co-creation Hub Nigeria (Cc-Hub). 89. Tobi Ayeni: She is a Digital strategist and the founder of MissTechy.com –Nigeria’s leading female tech blog. 90. Tolu Agunbiade: Co-founder and chief executive officer of Skrife –an online platform that helps develop original written content. 91. Tunde Ayilara: With an ambition to become the ‘Amazon of cakes’ in Africa, Tunde is the co-founder of Waracakes –an ecommerce website that is bringing cake merchants and buyers together. 92. Tunji Alao: He is the Chief Executive and founder of VacantBoards –an internet based outdoor advertising marketplace that keeps records of billboards. 93. Victor Asemota: Chief Executive officer and principal officer of Swifta Systems and Services International Ltd, a professional services company focused on technology service delivery and business change management. 94. Yasmin Bello-Osagie: Co-founder of She Leads Africa – a social enterprise that is committed to supporting the growth of female led startups in Africa. Yomi is a foremost Mobile, web and content developer. He is the founder of Mobility Arena -a media plarform that provides mobile reviews, news, tips and great deals. 96. Yusuf Adewale: An avid photographer, Adewale is a technology journalist and the lead content developer of a fast growing and people-centric blog –Techpoint. 97. Zakaria Hersi: He is the Managing Director of Efritin.com – Nigeria’s No.1 marketplace for used goods and services. 98. Zubair Abubakar: Co-founder of ChopUp. ChopUp is a mobile social gaming startup that is building locally relevant games for mobile Africa. 99. Joshua Chibueze: He is the co-founder, Head Brand and marketing at PushCV –a career guidance website. Joshua is also the co-founder of Piggybank.com, an online platform that helps Nigerians save money for achieving a goal. 100. Temilade Olukogbon: He is in charge of operation at Iwemoto.com –an online platform that helps people create drivers license without stress.